Language is a fundamental human accomplishment. It is the foundation for literacy, underpins academic and social success, and is important for developing and maintaining relationships with others. So it is no surprise that children who struggle to acquire their native language are at a distinct disadvantage when they start school. Our research, recently published in the Journal of Child Psychology and Psychiatry, found that two five-year-old children in every Year 1 classroom of 30 had a currently unexplained language disorder. An additional 2.34% had a language disorder that occurred as part of another developmental condition, such as autism or Down syndrome. Children with language disorders have problems with speaking and listening. They tend to have limited vocabularies, leave endings off words and use very simple grammar in their sentences. They have difficulties telling coherent stories and don’t understand complex instructions. This causes many problems in the classroom. So for example, children with language disorders will struggle to understand questions such as “which of these items will float? Why do you think so?” Even if they understand and know the answer, they may not be able to use words to explain “the ball will float because it is filled with air and is lighter than the penny.” A child with language disorder may just point and guess, or articulate a couple of key words such as “the penny sinked”. Our study involved more than 7,000 children and 190 schools in Surrey, south of London, in order to find out how many children in England start school with a language disorder – what is known as a prevalence estimate. This may sound straightforward to work out, but it isn’t. As language is multi-faceted, we measured vocabulary, grammar and narrative skills both when the children were speaking and listening. This is the combination of tests that has informed current diagnostic criteria for language disorder. Different studies have used different cutoffs for language disorder, but the severity of the cutoff point can drastically affect the estimates of how prevalent problems are. In our study, children who scored in the bottom 7% of all pupils in the tests we gave were deemed to have a language disorder. We also considered children’s non-verbal reasoning skills by asking them to solve problems that don’t involve words, for example, choosing the next step in a visual sequence from a selection of visually similar items. Children with good non-verbal skills may mask problems with speaking and listening. For example, a very social child with language disorder, who is quick to learn new activities and can copy what other children are doing may not be able to follow complicated instructions such as “put your boots on after you find your coat” or may use very simple language like “him doing picture”, rather than “he is painting a picture”. In recent years, many experts have argued that non-verbal skills should not feature in the diagnosis and decisions of how to treat children with language disorders. But many children with poorer non-verbal ability as well as language disorder can still find it difficult to meet eligibility requirements for specialist speech-language therapy services. 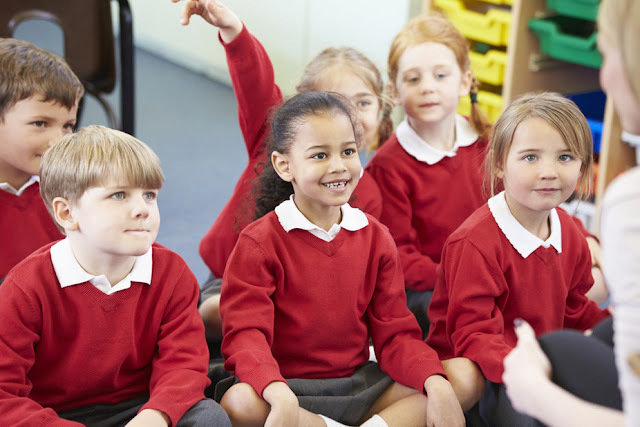 To measure the impact of language disorder we took advantage of the fact that all children in England are assessed on the Early Years Foundation Stage Profile at the end of their first year in school. To achieve a “good level of development” children must meet or exceed 12 key curriculum targets, which cover speaking, listening, reading, writing, numeracy, physical and personal, social and emotional development. Most of these items tap into children’s ability to use language in the classroom, for example to play co-operatively, share ideas and form positive relationships with others. Overall, we found that 7.58% of children starting school had an unexplained language disorder. Our estimate included children with low non-verbal abilities, and including these children increased the prevalence of disorders by almost 50% – from 4.8% to 7.58%. But we found that low non-verbal ability did not result in more severe language impairments, more pervasive behaviour problems or more serious academic difficulties. Children meeting our criteria for language disorder were very unlikely to meet education targets on the early years profile – only 11% of them did so. They were also more likely than their peers to display social, emotional and behavioural difficulties. Despite this, fewer than half of the children who met criteria for language disorder had been referred to speech-language therapy services. It’s clear from our research that a greater focus is needed on oral language development in the early years. Many teachers suggest that oral language needs to have the same status and protected teaching time that literacy and numeracy do. In the early years particularly, improving oral language should have positive impacts on later literacy, behaviour and social development. Of course there will still be some children who require specialist support, and our findings clearly indicate this should not depend on non-verbal ability. Instead, speech-language therapists should base decisions on eligibility for support on the child’s language and communication needs. But children with lower non-verbal abilities may not respond to intervention in the same way that more able children do. It’s difficult to prove this, in part because children with lower non-verbal abilities are often excluded from trials of interventions that could help them. Nevertheless, that shouldn’t mean they get no help – only that we need to establish the most appropriate way of helping children with multiple developmental challenges.